"Week 2 at Ivels Bed & Breakfast got off to a great start. 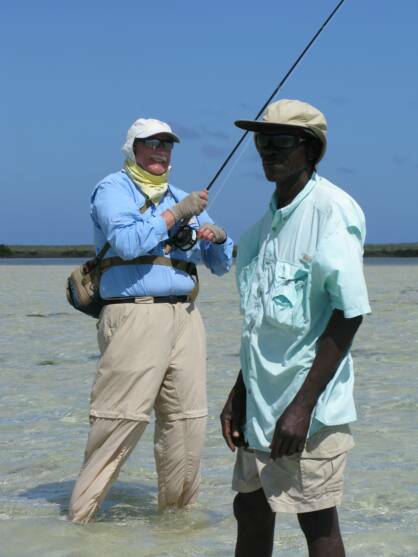 After a delicious lunch prepared by Mrs. Gibson, we quickly unpacked our fly fishing gear and prepared to enter the beautiful expanse of mangrove lined bays and flats right outside the front door. John and Dave began working south from the lodge, while Mike and Jim drove down the road a mile or so, parked the vehicle and began fishing back north. Our plan of attack would cover the entire expanse near the lodge. By the time we started the tide had ebbed. The water inside the mangrove creeks was pretty thin. 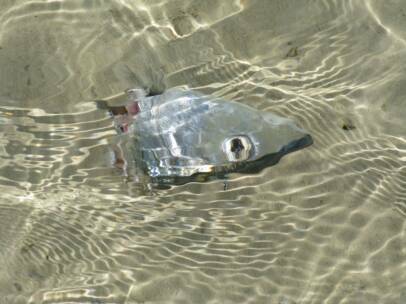 The bonefish had apparently flushed out into open water. 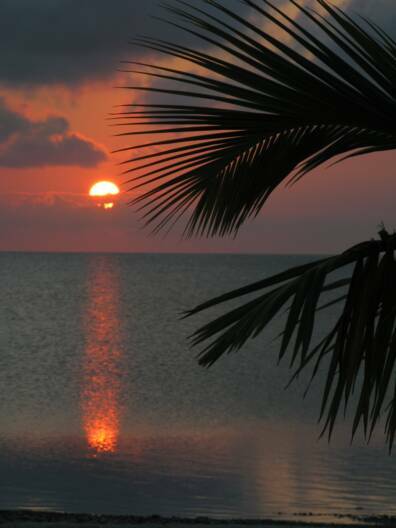 Working north outside the mangroves, Mike and Jim witnessed a spectacular chase as a four foot blacktip shark explosively overtook and ate a bonefish. Jim briefly hooked the aggressive shark as it swam from the kill, but the hook dislodged during its first powerful run. We were actually a bit relieved with the “long distance release”! 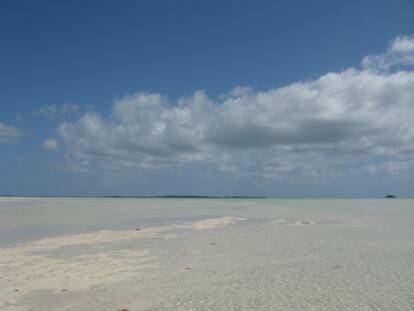 Meanwhile, Dave spotted a huge school of mudding bonefish just off a point. He caught several good ones as the mudding school fed happily and remained relatively stationary. John joined him and together they captured a total of five bonefish until another shark showed up and scattered the mudders. Continuing around the point into the first bay, both Dave and John got into several more bones. 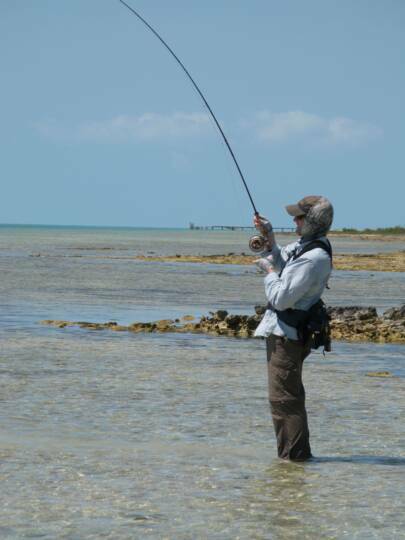 The weather was beautiful – clear skies, light winds, and plenty of bonefish. The hours passed quickly. 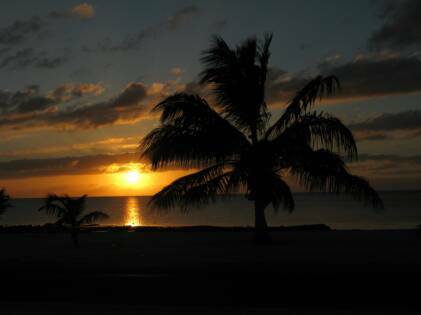 A fantastic sunset brought the first of the week’s many great adventures to a spectacular close. The subsequent days flew by. 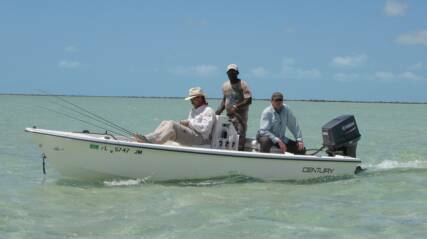 We happily fished many of the northern flats, Delectable Bay, Ivels Flats, Jamaica Cay, Snug Corner. During the week, Dave and John extensively explored some of the northern flats. 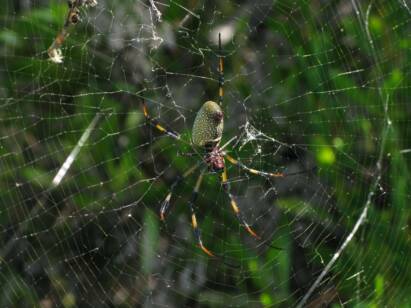 They discovered some very productive fishing near small blue holes in this area. 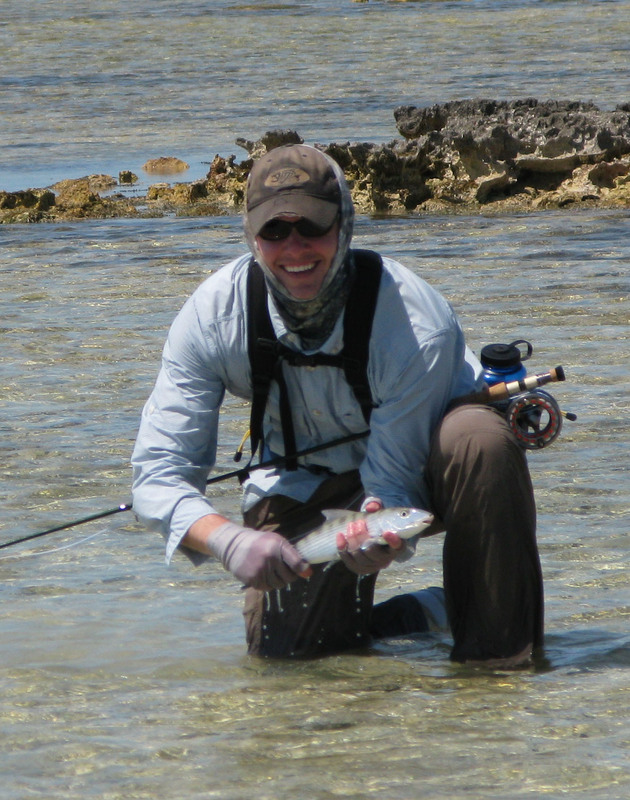 Although the fishing seemed to be best on the mangrove edges at higher tides, it was also good at low tide when the bonefish took refuge in the blue holes. The moon phase was waning crescent, so the difference in tides was relatively small (approx 1.5 to 1.7 foot elevations). Many flats seemed to fish best on a falling tide, with some unusually big fish tailing and cruising a few nice interior flats. 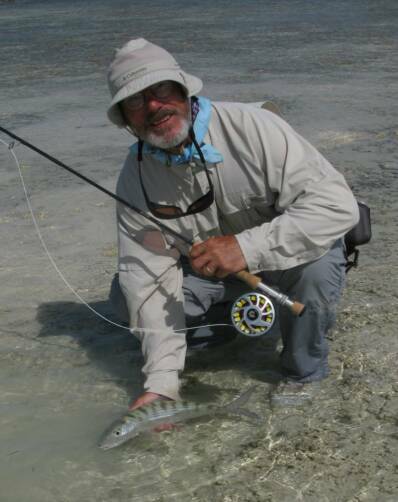 Those older, more experienced bonefish were really spooky. 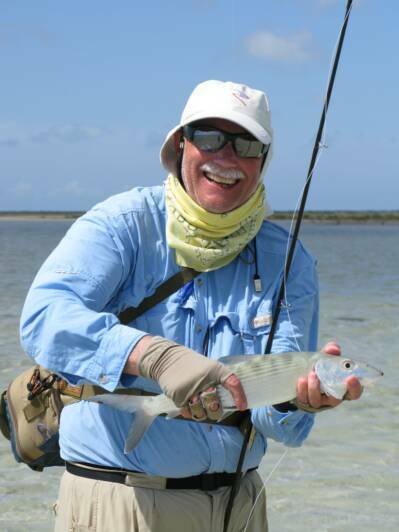 Dave’s persistence led him into good numbers of bonefish in and around the north end of Acklins . It was consistently good up there on pretty much all tides – so much so that he and John chose to return several times, despite forgoing opportunities to investigate other parts of the island. It was that good. We also made an intriguing discovery at one nice flat/creek system. While Dave waded the interior flats (getting into a few bones and a lot of barracuda, snappers & jacks), John, Mike and Jim waded the bayside flats. We encountered several schools of bonefish staging up at the mouths of the channels on the last of the outgoing tide. The fish repeatedly returned to the creek mouths. We posted an angler to stand motionless at each creek mouth. 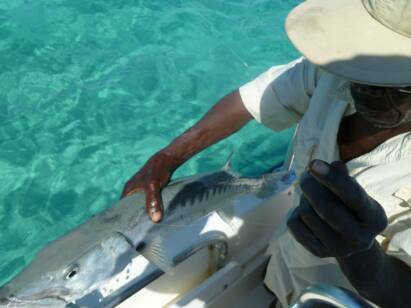 This allowed us to see the bonefish as they approached, and cast ahead of them without spooking the oncoming school. 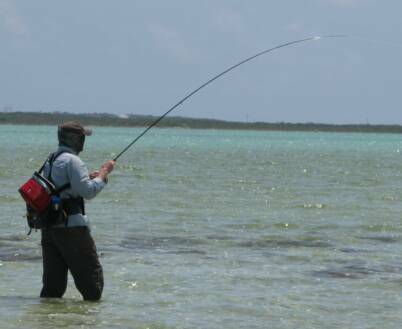 In this manner, we hooked quite a few bonefish on gotchas and Peterson shrimp patterns. Unlike last week, however, we saw no permit in this area. Mrs. Gibson at Ivels Bed & Breakfast made arrangements for us to hire Marvin and JB as guides during mid-week. The guide fees were quite reasonable. On Wednesday, we travelled by skiff almost an hour north of Snug Harbor then wade fished several channels in a rising tide. 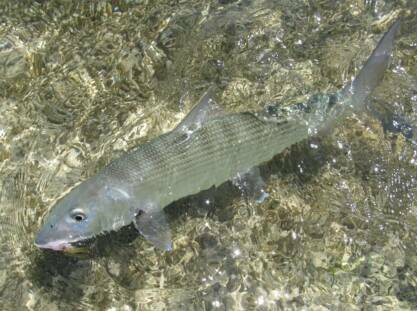 We repeatedly encountered large numbers of relatively undisturbed bonefish in near wilderness conditions. It was a fine day with many big, dumb fish. Everyone got into bones in a big way. The next day, while Dave and John fished upper Relief Bay, Mike and I spent another guided day with JB. 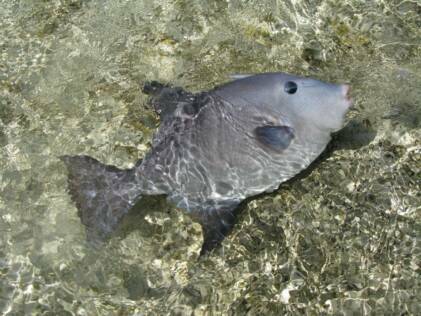 This time we motored south to wade fish at Jamaica Cay. JB is a master guide. He has an encyclopedic knowledge of the area, the tides, and the movement patterns of the fish. We lost count of the number of bonefish hooked up. We also spent an hour of two fishing for barracuda – not just any barracuda; but the big, scary brutes that haunt the points and deep edges. We tallied four of these incredible fish, the largest being just over 20 pounds. It was a terrific experience to be with and learn from these great guides. Many thanks to Mrs Gibson for arranging for us to fish with Marvin and JB. The accommodations at Ivels Bed & Breakfast were first rate and very comfortable. The air conditioning was really refreshing after a long day on the tropical flats. Whenever a question arose (and there weren’t many), the property manager Casey was quick, cordial and very efficient in providing assistance. The food was excellent; tasty, nutritious, and in more than ample amounts. Although the traditional Bahamian breakfast might be fish chowder or baked snapper, we opted for an American style breakfast of eggs and ham or bacon, toast, juice and coffee. Packed lunches were prepared for us every morning; and delicious Bahamian suppers were served when we returned in the evening. We were provided a late model Ford Escape as transportation to and from the flats. It was comfortable, in decent repair and got good fuel economy (over 20 mpg) – which was important because gasoline cost $6.25 per gallon on Acklins Island.